There is a secret Delight pervading the ascent of Life as it wriggles from a material existence to reach a divine consummation. Delight expresses itself through the movement of Love but Love depends upon the interchange between the possessor and the possessed. This equation is evidently not apparent when in its first status, Life animates material forms in accordance to an universal but hidden will. 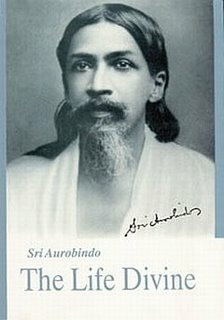 But the full emergence of the universal ‘will’ of creation, the illumined fulfilment of desire and the unity of the possessor and possessed in a deep rapture of perfect love would only be possible in the fourth status of Life that could blossom into a Gnostic community based on soul kinship. How does Life ascend to the domain of the Pure Spirit from the world of limitations? How does Life transcend the quagmire of death, ignorance, incapacity and suffering? What is that which sustains Life amidst all negativities and motivates it to progress beyond its limitations? To understand this riddle, we have to appreciate the great yogic discovery that the world is ‘a masked form of Sachchidananda’. (Ibid) It is a projection and inverted poise of the Supreme Reality, experientially perceived as the triune of Sat (Existence), Chit-Shakti (Consciousness-Force) and Ananda (Bliss or Delight). While Sat is the truth of the Being, Chit-Shakti or Conscious-Force builds the matrices of consciousness and energy that get aligned as the multiverses. Ananda or Bliss is the value aspect of the manifestation. Ananda is an Omnipresent Delight that gives meaning to the manifestation. These attributes of Reality get reversed in the world as we know it. The Being gets limited by death. Consciousness sinks into Inconscience. Force or Shakti becomes disconnected from Consciousness and as a result Knowledge gets de-linked from Will-Power to present a spectre of incapacity. The ego cannot bear the effulgence of Bliss which get represented in terms entirely opposite to its essence. In such a scenario, it would be difficult to re-connect with the Supreme Reality.